I won a green card in the DV lottery - What now? Diversity Visa Lottery Results are announced annually by the US Department of State Kentucky Consular Center in Williamsburg, Kentucky only. No other organizations or companies are permitted to send the results to the selected people. Each year after the submitting period is over a computers in the the US Department of State Kentucky Consular Center in Williamsburg, Kentucky will randomly select winners from the registered entries. They will be given a case number according to the fiscal year and of the selected applicant’s birth country’s geographical region, example of such a case number: 2015AF000000. If you are selected in the green card lottery you will NOT receive a letter from the U.S. Department of State Kentucky Consular Center in Williamsburg, Kentucky, you will not receive any communication at all. It is the applicants responsibility soly to check on-line if they were selected or not in the DV Lottery. If you check on-line and you were selected a winner confirmation page will appear, see example above. This winner notification will inform you, that you have been selected in the DV lottery. Being selected in the Diversity Visa Lottery does not automatically guarantee that you will receive a green card. Each year more lottery winners are selected to apply for green cards than there are green cards available, so it is important that selectees act promptly. If you are selected in the lottery, you will be required to file a formal visa application and attend a visa interview at a U.S. Embassy prior to receiving your visa or adjust your status if you are located in the United States. In support of the application, it is necessary to provide documentation proving that you satisfy the work or education requirement. It may also be necessary to prove that you will not become a public charge, dependent on the U.S. government for support. This can be established by demonstrating considerable assets, a job offer, qualifications for jobs that are in demand, or an affidavit of support. The winner must decide whether to immigrant visa process abroad or adjust status within the United States; and regardless of the decision, the winner should expeditiously file the application. With more than 100,000 winners competing for 50,000 visas, winning the lottery implies a race to the finish as less than half of winners actually obtain their immigrant visas. In cities where adjustment applications take many months, the choice becomes even more difficult. Furthermore, since visas cannot be guaranteed because of the limited annual quotas, advising a registrant who has eligibility or exclusionary problems becomes even more complex (particularly where the registrant’s rank number is high). This is because person with high rank order number may only have thirty to sixty days to complete their adjustment whereas security checks alone could take ninety days. Students or visitors who are selected for the lottery must be especially careful in their strategy for acquiring permanent resident status. Long delays in scheduling adjustment interviews at most USCIS District Offices or waiting for security clearances result in visa number exhaustion. When applicants finally attend their interviews, they are shocked to find that there are no visas left. Adjustment of status applicants are even more surprised to find themselves in deportation proceedings as their tourist visas have expired. Students are surprised to discover that their nonimmigrant intent has been destroyed and they are unable to apply for new visas abroad because of their expression of immigrant intent by applying for lottery green cards. This results in disruption of the student�s U.S. educational program. 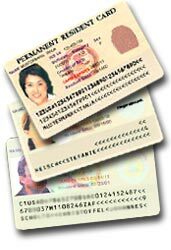 First be aware, there is a green card scam going on. Scammers send spam emails pretending to be from the U.S. government congratulating the recipient that they have been selected in the Visa Lottery. More and more people are sending emails to unsuspecting people saying that they are winners of the DV lottery and eligible to American Visa. To proceed they ask them to send $400 to $900. Their email look as it coming from US Government. A closer look will reveal that there is no mention of your name in that email. Also the email sender will ask you to contact another email or Telephone number which are not in the USA. First of all the U.S. Department of State Kentucky Consular Center in Williamsburg, Kentucky will never send email notification to the Diversity Visa Lottery, (green card lottery) winners. They do not even send Postal Mail notification to the Winners. Furthermore, there will be no money involved when you deal with the United States Government. You will only pay the visa fees in person (i.e. no Western Union) at your country US Embassy when you are getting your immigrant Visa at your interview.